I am trying to understand the working of TLS. I understand that there are various way to generate the master secret used to encrypting the data. Such as DH (Ephemeral DHE) and RSA. I understand that, when using RSA, the client generated pre-master key is encrypted by server's public key and is sent back to server for the computation of the master secret. But what about the process when using DHE? I see that DH public keys of both client and server is used to compute the Master secret? But, is the DH public key the same as the Server's public key? In Layman's term, is the RSA public key considered as the server's public key? Short answer: it can be, but it's complicated and it depends on what kind of certificate the server has and which TLS cipher suites it's configured to use. This answer is essentially a copy of this openssl wiki page. Let's go through some examples. The session key will be generated client-side and sent to the server encrypted with the server's RSA key. For the authentication part of the handshake, the server will use the same RSA key to produce a signature (I think). Note: clearly this is insecure. As noted here, the signature algorithm (RSA/DSS) indicates which signature algorithm the CA used to sign the certificate and there is no signature as part of the handshake; if the server arrives at the same session key, then it must have the matching DH private key. Note: this is old and deprecated, people prefer DHE now. Since the DH is ephemeral, a new DH key will be generated for each new connection so there is no need to put it in a certificate. The RSA key is used to sign a challenge response to prove that the server is who they say they are. These are the preferred ciphers these days. 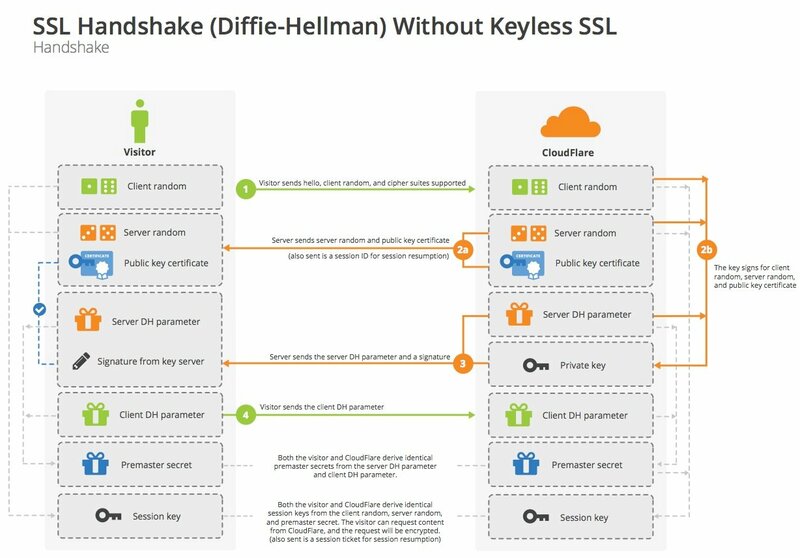 CloudFlare explains that Diffie-Hellman and RSA, both used in key exchange mechanisms, have advantages. Keyless SSL: The Nitty Gritty Technical Details . I believe Diffie-Hellman and its TLS/SSL usage will further explain. Presuming the "server's public key" is used for authentication, then no. The DH public key and the server public key, are not the same. However, I have seen very much mixed opinions on this matter. TLS 1.2 appears to use DH and RSA for the key exchange mechanism. DH is used to produce the symmetric key for a symmetric algorithm. DH in itself is not a data encryption algorithm necessarily, but a way to agree on a secret key via a public network. Not the answer you're looking for? Browse other questions tagged encryption tls rsa diffie-hellman terminology or ask your own question. What are the performance differences (for client and server) between DHE and ECDHE in TLS?